Mannheim, April 11, 2018 – In these times of ever more stringent legal emission requirements, aerodynamics – one of Röchling Automotive’s core competences – is an important lever for the automotive industry. The lower the vehicle drag, the lower the energy requirements, and that ultimately means less emissions. The complete package of active aerodynamics components from Röchling Automotive reduces the aerodynamic drag considerably. The controllable intelligent Active Grille Shutters (AGS) systems which regulate the airflow through the engine compartment show great potential here. Röchling Automotive has been developing these systems for many years now and is the global market leader in the field. Air shutter systems have undergone considerable improvements in the course of the last few years. They used to be manufactured as a horizontal system and positioned in front of the cooling package. Today, however, they are more dynamic than ever as they can be produced as vertical units which can be directly integrated into the radiator grille as well as into the structure of the vehicle. The results of countless simulations show that aerodynamic drag can be reduced most effectively if the system is positioned in a sealed environment as close to the front of the vehicle as possible. 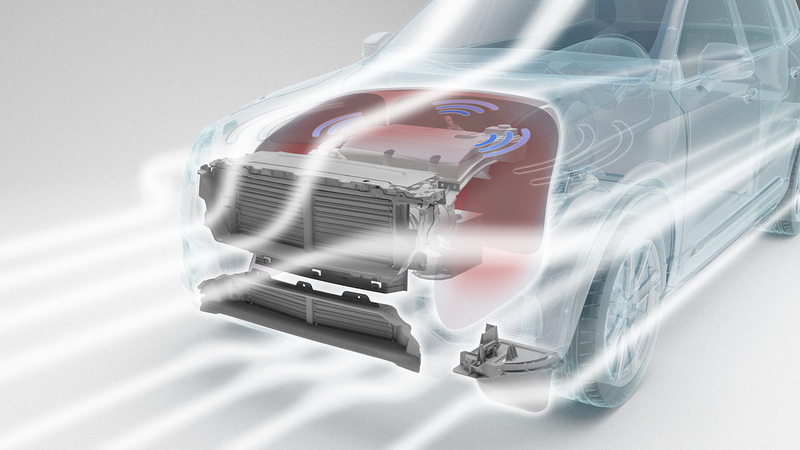 Besides improving efficiency, Röchling Automotive’s Air Grille Shutters system gives vehicle manufacturers additional design options. Wind channel tests have already demonstrated the potential of the AGS system to reduce the aerodynamic drag coefficient by up to 6 percent. For optimum results, an Air Grille Shutter system covering the whole surface can be combined with an engine capsule. Here, the engine compartment is covered with a material that prolongs the engine cooling period and has a positive effect on noise development. Another technology used to optimize drag is the Active Air Blind. Here, a technical textile is moved up and down by a winding shaft with an integrated cable guide, both suspended in a frame. Besides weight benefits, this technology ensures extremely low leakage thanks to the textile, which covers the whole surface, as well as low packaging requirements. Both the Active Air Blinds and the Active Grille Shutters shorten the engine warming-up period, and this in turn has positive effects on emissions and fuel consumption. For more information on Röchling Automotive and other aerodynamics solutions such as Active Speed Lips - which direct the air around the tires and reduce turbulence - or on the Integrated Sandwich Floor concept, please go to www.roechling.com. The AGS system from Röchling Automotive contributes to a significant reduction of vehicle aerodynamic drag.